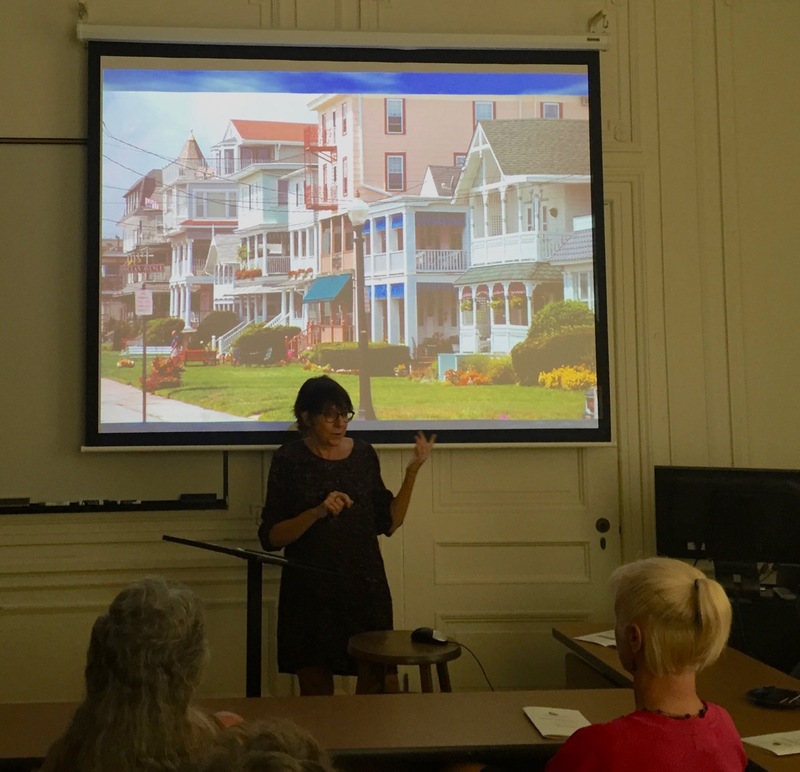 A lecture about Ocean Grove at Monmouth University. In 2002, a professor at Monmouth University, Dr. Karen Schmelzkopf, published a paper in the Journal of Historical Geography entitled, “Landscape, ideology, and religion: a geography of Ocean Grove, NJ.” It is a remarkable academic study which shines a light on important issues in Ocean Grove’s history including physical, cultural and political variables and interactions. 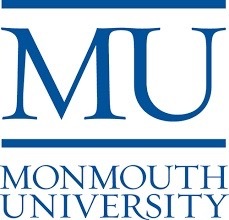 She contacted Blogfinger to say that she was going to speak about Ocean Grove at the MU Monmouth Forum speaker series on July 27, 2016, 1:15-2:15 pm,. in the Library, room 206 (the incredible former Guggenheim mansion.) It is extremely unusual for an outside unbiased expert to speak about Ocean Grove beyond the stone pillars of town. Editor’s Note: July 27, 2016. About a dozen Grovers attended the lecture. Among them were Jack Bredin, Kevin Chambers, Connie Ogden, and Lee Morgan. No official representative of the Home Groaners was present. No Historical Society officer was there either. As far as I could tell, no one from the CMA was in attendance. Dr. Karen Schmelzkopf spoke about the “ideology” of the “Holiness Movement” which the founding Methodists implemented in their religious community called Ocean Grove. That movement stressed “perfection” which had to do with working hard to influence a person’s future and achieve desired Christian results. The geography of OG, with water on three sides, was well suited to their ideals of “autonomy, heterogeneity, and exclusion.” The gates at the fourth side helped with that plan. Early in OG’s history, only Methodists were allowed in. Much of the architecture had deteriorated, and tourism was failing. Their leaders were “firm, persistent and well connected professionals” who knew how to manipulate the system. They had a “very effective action plan” which helped members get elected to the Neptune Township Committee to bring attention to the Grove’s plight. Some of the CMA trustees were HOA members. They wanted to strengthen the “community” in OG, so they lobbied the State government for help with the mental cases which were languishing, and about 200 people were moved to other communities. The Methodists in town did not see their actions as “un-Christian.” They thought that it would help save the town and would be better for the patients who were not receiving necessary services, as promised, in the Grove. Dr. Schmelzkopf credited the growing gay community with restoring many properties, helping to raise home values. As for the governance and demographics of today, she plans to conduct further research, but an interesting observation, at least based on her prior work, is that 40% of residents here are renters whom she thought were being disenfranchised by the Home Owners Association. She thought that despite the various potentially influential factions in town including the HOA, the CMA and the taxpayers, the citizens are frustrated by the fact that Neptune is still calling the shots in Ocean Grove. The professor would like to look at the current demographics and dynamics in town, and she promises to return for part II of her OG research. We thank Dr. Schmelzkopf for her presentation and hope that some group in town brings her here to discuss her views in more detail. She expressed an interest in doing that. Editor’s note: You will notice that we do not refer to the OGHOA as the “Home Groaners” in this article. That is out of respect for the historic HOA described by Dr. Schmelzkopf. But now, that group has utterly failed to address key issues in town, and thus it would be disrespectful to use their historic name on these pages….. unless they get resuscitated, in which case I would gladly use their original name. Why don’t we invite her here? For example, the auditorium in the old high school. Old timer: Dr. Schmelzkopf offered, but I would need to work it out. Will you help me get the venue? The Blogfinger staff is a bit shorthanded these days. I proposed the auditorium because Herb Herbst spearheaded the effort to restore that venue. He was the leader of the Homeowners Association. One would think the HOA, the Historical Society, the OGCMA, or even the Chamber of Commerce would individually or collectively arrange for this important presentation in Ocean Grove. I would suggest a date in early September, time 7 pm. If they wanted to invite her she can be reached through the Dept. of History and Anthropology at Monmouth U.
It’s about time we put to rest the cliché that Ocean Grove was saved by the gays. This is something I have heard quite a few times in the past. The real heavy lifting was by the courageous and aggressive HOA of that era. Yes the gays invested in run down houses and fixed them up, but so did many others such as myself. And as for their starting businesses here, so did others. So let’s give credit where it is due and move forward as a community while diminishing tendencies to divide us up into factions. Herbst and Paladino. leaders at that time of the Home Owners, provided the leadership that turned this enclave around. When I arrived there was a dumpster on every block. It was gay business and other professionals restoring downtown and those vintage homes. Perhaps when the Methodist Book of Discipline recognizes gay/human rights and the Camp Meeting Association landlord responds to contemporary residential and business realities and has a future vision will factions disappear in Ocean Grove. Anonywoman #2. During the discussion of the mentally ill who behaved erratically in the Grove, this woman said that she was a child in the Grove during that era and that she and her friends had nicknames for all the erratic patients who wandered around and slept on the benches. No one asked her for examples. Anony #1 disagreed saying that OG was a well known haven for blacks. The 2010 census shows 5.5% African Americans in OG—a bit higher than 2000.
on July 29, 2016 at 12:11 pm Paulie D.
Blogman: Great reporting on the pulse of the presentation. The Guggenheim buIlding is magnificent. 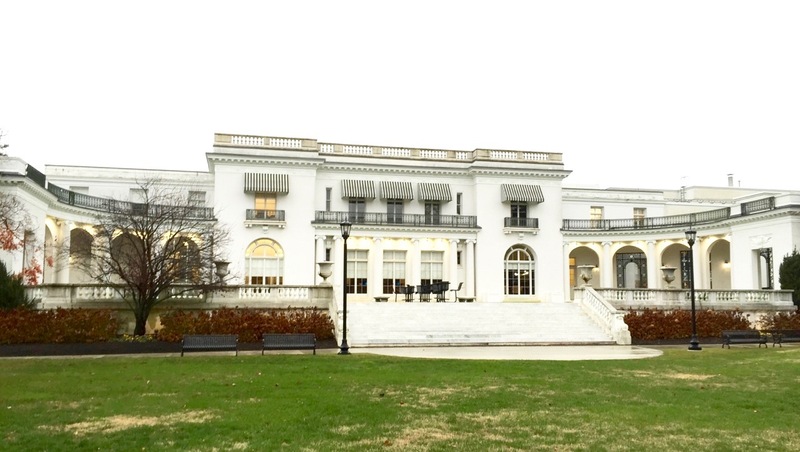 While standing on the massive marble steps of the “summer cottage”, I envisioned Solomon Guggenheim enjoying the view from those very steps and perhaps visiting with his neighbor FW Woolworth who lived in the cottage next door. Oh, the gilded age! I can also imagine Solomon standing there today, eyeing those Monmouth U. coeds sprawled on his lawn. See you around the hood. Paulie G.
What Ocean Grove was Anony #1 living in? Ocean Grove…a haven for blacks? As someone born and raised here…and who was told the black friend who came over in the afternoon to play was not welcome on “our” block…I didn’t see any haven. Many of the Grovers had not spoken to a black person (not counting the servers at the Grand Atlantic/ Sampler Inn) until they went to integrated 7th grade. Even today, many older African-Americans from Neptune reminisce that they were always afraid to cross those gates into Ocean Grove. It is not a proud history. I missed this lecture, but repeat BRING HER HERE ! If her lecture is well publicized and at a good time (early evening), I think that the Community Room, where HOA holds meetings on Saturday mornings, would be too small. Bishop’s Janes? Youth Temple? Jersey Shore Arts Center auditorium? Permission and/or rental fees for these venues? Also, it is common to give an honorarium (perhaps $100.) when one invites a scholarly speaker. I am not suggesting charging admission. It seems to me that the HOA, CMA, Historical Society, Chamber of Commerce should have the funds to sponsor her talk. Old timer: Getting those four community-based organizations to agree on one thing like sponsoring the aforementioned speaker would be a major milestone at the moment. Know anyone in the Historical Society who could assume leadership for such an effort? OT: I think you overestimate the interest of OG citizens in the topics which we reported on. It’s a shame, because the town’s history is fascinating and is more than about Victorian architecture.